Taskin Ahmed and Arafat Sunny both are suspended by International Cricket Council (ICC) due to illegal bowling action. It’s the shocking news for all bangali and Bangladeshi supporters. After the declaration of ICC such shocking news, majority analysts say that Sunny could be suspended due to elbow extension violating rules and Taskin could be warned, but not suspended. Here is a question raised; is it legal Justice on Taskin? Sunny and Taskin are main bowler of Bangladesh Cricket Team. Taskin is a right-arm fast bowler and Sunny is a slow left-arm orthodox spinner bowler, they are also important players by the choice of Bangladeshi captain Mashrafee bin Murtaza. Murtaza also ‍sorted his team preplanned before T20 world Cup. But before the start of super ten match in T20 world Cup, suddenly Taskin and Sunny were reported for suspect actions following Bangladesh’s eight-run win over Netherlands in a qualifying match in Dharamsala on March 9. Both are suspended due to their elbow extension had exceeded the 15 degrees’ level of tolerance permitted under the ICC Regulations. According to ICC’s protocols, they underwent an independent assessment in Chennai within 14 days and were allowed to continue bowling in international games until the result of the tests. That means if this suspicion is proven then they will not be allowed to play any international game, but they can only play internal games reported by Bangladesh Cricket Board (BCB). Both are prepared to examine their bowling action. So, Sunny went to Chennai with spin coach Ruwan Kalpage on 13 March for testing his bowling action and Taskin went with bowling coach Heath Streak on next day 15 March regarding to testing his bowling action. According to the rules of ICC, the test result could be published within 7 working days. After 4 days later, on 19 March announced that independent assessments have found the bowling actions of Bangladesh’s Arafat Sunny and Taskin Ahmed to be illegal and, as such, both the bowlers have been suspended from bowling in international cricket with immediate effect. Bangladeshi cricket supporters got an enormous stroke due to think of losing Taskin and Sunny from running T20 World Cup. Taskin Ahmed represents Dhaka Metropolis in first-class match and ‘List-A’ cricket and the Chittagong Kings and Chittagong Vikings franchise in the Bangladesh Premier League. Taskin has gained 21 wickets by 14 One-day international matches and 9 wickets of 13 T20 matches. On 17 June 2014 Taskin took 5 wickets by 28 runs against India as the first Bangladeshi ODI debut bowler. Arafat Sunny made his debut for Dhaka Division in the 2001–2002 seasons. 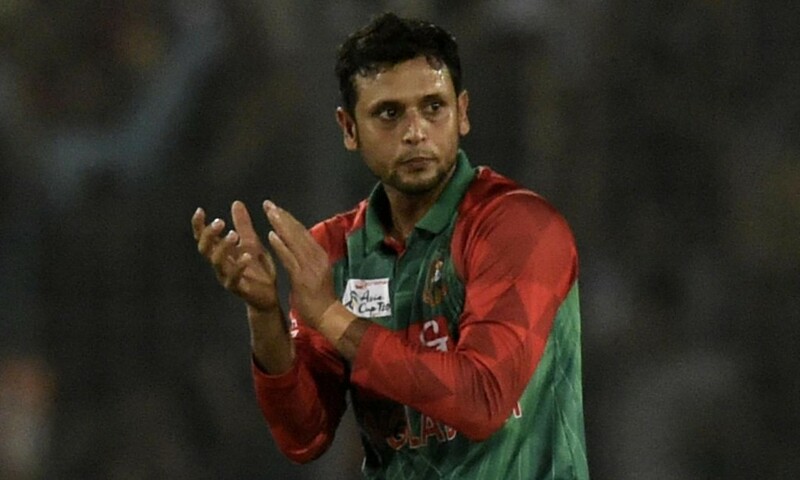 He currently plays in National team and also Chittagong Kings franchise in the Bangladesh Premier League. He has the best bowling figures of 4/29 and 4/27 against Zimbabwe in consecutive ODIs in the bilateral series in 2014. What really say the ICC Regulation? According to the assessment of ICC, Arafat’s analysis revealed that the elbow extension for majority of his deliveries had exceeded the 15 degrees’ level of tolerance permitted under the ICC Regulations for the Review of Bowlers Reported with Suspected Illegal Bowling Actions, while not all of Taskin’s deliveries were legal. But sometimes later, another news shocked Bangladesh again that Taskin also banned for illegal bowling action. National international news media derailed this news coverage strongly. BCB and all personnel’s are sure to be success of Taskin’s assessment. After that news, question has raised on the ICC’s neutral assessment. We can know what really say in ICC Regulation. According to the Regulation 2.2.6 provides that “during the Independent Assessment, the Player shall be required to replicate the specific bowling action for which he/she was reported. The bowling action in match with Netherlands where he was reported is available to test”. But it shows that during the course of the match, Taskin did not bowl any bouncer. So, he could not have been reported for bowling a bouncer. He was reported from the Netherlands, but he doesn’t make any bouncer delivery this match. It appears that during the Independent Assessment, Taskin was asked to bowl 8 or 9 bouncers within 3 or 4 minutes. He bowled 9 bowls bouncer. It is also a so tough for any international bowlers like ICC top ranking Bowlers Glenn McGrath, Trent Bolt, Imran Tahir etc. Moreover, the report shows that 3 bowls are fault out of 9 bowls, where his elbow extended 15 degree or more. Taskin’s action insofar as his stock delivery and Yorker being found legal, and these being the only deliveries bowled during the course of the match for which he was reported, it is clear that he did not employ an illegal Bowling Action during the match in issue. According to the regulation of ICC, without Stock delivery any other delivery may extension 15 degrees. So, ICC can make any obstacle to Taskin. Regulation 2.2.13 refers that “where the Independent Assessment concludes that the Player employed an illegal Bowling Action during the Independent Assessment in respect of a specific type of delivery only, other than his stock delivery, the Player will be allowed to continue bowling in International Cricket but subject to the warning that should he continue to bowl any of the specific type(s) of delivery for which he has been found to have an Illegal Bowling Action, he will run the risk of being cited a second time”. Since Taskin’s stock delivery has been found legal and only 3 of his 9 bouncers illegal, he can, at best, be warned, and not be suspended. Bangladesh has played Charming game in Asia Cup T20 Tournament 2016. The Bangladeshi team has runner’s up in this tournament. India beat Bangladesh by 8 wickets in the final to win their sixth Asia Cup title. This tournament Bangladesh beat United Arab Amirates by 51 runs on 26 February, Sri Lanka by 23 runs on 28 February and Pakistan by 5 Wickets on 2 March. Due to the sequence win, Bangladesh has reveal to the real face of tiger. Bangladeshi bowler Alamin, Mahmudullah has also contribution to take highest wicket but Taskin has only contribution to take a maiden and 3 wickets. Basically, he is really being a tiger due to his bowling speed and good length bowler. Taskin has no good score in Asia Cup T20 Tournament, but has also a carrying success of speed bowling. After Rubel Hossain, Taskin Ahmed is the 2nd Fastest Bowler in the history of Bangladesh cricket. He has clocked 148 Km/h against Pakistan in Asia cup 2016 where Rubel Hossain has an impressive 149.5 km/h in a warm up game in 2009 ICC World Twenty20. Rubel is in injury at right now. So, Bangladesh team has only dependent on only Taskin and Mustafizur Rahman. So, Taskin has targeted by India and Australia due to his good spell. Taskin and Sunny has reported to test their bowling action during the World Twenty20 first round match against the Netherlands in Dharamsala on 9 March. Exactly this match is driving by Sundaram Ravi of India and Rod Tucker of Australia as two on-field umpires. On the other hand, Arafat sunny is an important bowler for Bangladesh right now. He has not good bowling records in previous series, but has also contribution in average bowling score. Basically, Taskin and Sunny is the choice list of Bangladesh captain Masrafee Bin Mortaza to decorate his bowling line. One thing, the bowling style of Sunny is illegal due the extension of elbow 15 degrees or more according to ICC regulation. Every BCB personnel’s are believed that Sunny can be banned for illegal bowling action but not imposed such burden for Taskin. Actually, this is the conspiracy of India and Australia to banned Taskin. So, they decorate a story to suspend Taskin, they involved the name of Sunny and Taskin. Everyone knows that Arafat’s elbow extension for majority of his deliveries had exceeded the 15 degrees’ level. So it is easy to proven fault Sunny and this is better time to band Taskin. Because India and Australia is in RED Group-2 consists of Bangladesh, New Zealand, Australia, India and Pakistan for World Cup T20 Tournament. From this group, 2 teams will be qualified for Semi final out of 5 teams. Here, New Zealand and Pakistan is a marvelous team in T20 series and Bangladesh also emerging team. Australia and India also powerful qualification to show their speed, but Bangladesh is important obstacle for that. Now question, why? Because, every team will play 4 matches that means play to each other. Then two top point gainer teams will be qualified for Semi Final. If Bangladesh any one match wins against Australia and India, then it could be a great barrier to qualify. And it has only possible to the by Australian and Indian umpires this Match. Other thing that the ICC assessment centre has also at Chennai in India, and the Bangladeshi team will be easy to go Chennai. There are other two ICC assessment centre are in America and Britain. This is the thinkable matter that, if we reported in India then they have to go Indian center to test their bowling action. Then India could apply their power as chairman of ICC. Because ICC is Indian decision oriented. That was the think of these two umpires. Bangladesh Cricket Board (BCB) has the right to sue against ICC under Regulation 2.3.1 regarding banned decision for Taskin Ahmed. BCB has already done petition to ICC. And ICC has already formed a technical committee to look into the issue. We want they are expecting a positive outcome from the technical committee. This is not the first time of Cricket history, the ICC has never lifted a suspension on a bowler on such a short notice, they did clear former Pakistan fast bowler Shoaib Akhtar within 11 days in 2000. Shoaib was banned on December 30, 1999, but only 10 days later, he played for Pakistan in an ODI against Australia in Brisbane, arriving a few hours after the match had started. From this history there are slight expectations that Taskin might just return before the Tigers’ remaining 2016 World Twenty20 Super 10 matches against hosts India and New Zealand. Although we don’t take back Taskin at short time, but we want to back Taskin as soon as possible. If BCB don’t get any result by review of ICC technical committee then should escalate it in arbitration up to the Court of Arbitration for Sports in Switzerland. It is an international quasi-judicial body established to settle disputes related to sport through arbitration. Its headquarters are in Lausanne (Switzerland) and its courts are located in New York, Sydney and Lausanne. Basically, BCB has to fight against ICC decision regarding Taskin Ahmed illegally through politically, diplomatically and legally bindings. Because, is is really a fault of ICC and Taskin is the victim of a miscarriage of justice. Salman Riaz is Journalist and international affairs analyst.